Subscriptions. The Bulletin is distributed free to faculty, staff and students. Others may subscribe to the Bulletin for $15 for the spring semester ($7.50 for current Princeton parents and people over 65). Send a check to Office of Communications, Princeton University, 22 Chambers St., Suite 201, Princeton, NJ 08542. Deadlines. In general, the copy deadline for each issue is the Friday 10 days in advance of the Monday cover date. The dead-line for the Bulletin that covers Mar. 7-20 is Friday, Feb. 25. A complete publication schedule is available at <deadlines> or by calling (609) 258-3601. Princeton NJ -- University senior Kyle Jaros has been named the recipient of the 2005 Daniel M. Sachs Class of 1960 Graduating Scholarship. The award, one of the highest honors given to Princeton undergraduates, was established in 1970 to provide a senior with the opportunity to study, work or travel abroad after graduation. It will fund Jaros’ tuition and living expenses for next year as he travels to Nanjing University to continue Chinese language study and to research the relationship between Chinese nationalism and China’s foreign policy in the early 20th century. A native of Palo Alto, Calif., and a graduate of Henry M. Gunn High School, Jaros is an A.B. candidate in the Woodrow Wilson School of Public and International Affairs with a focus on politics and international relations. He intends to pursue an academic or policymaking career in international relations. Classmates and friends established the scholarship in memory of Daniel Sachs, who starred in football and lacrosse at Princeton before attending Worcester College at Oxford University as a Rhodes Scholar. He died of cancer at age 28. The award is given to the senior who best exemplifies Sachs’ character, intelligence and commitment, and whose scholarship is most likely to benefit the public. 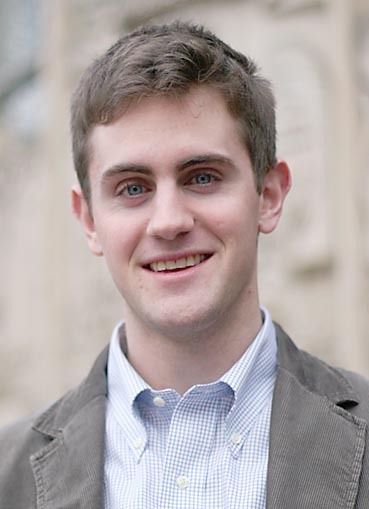 Currently, Jaros is completing a senior thesis on “Sovereignty Concerns and Multilateralism in Chinese Foreign Policy.” He conducted research in China on this project and also served as a research assistant for the Beijing-based publication, China Development Brief, in the summer of 2004. He attended the Princeton-in-Asia Beijing Intensive Language Program in the summer of 2003. Recently elected to Phi Beta Kappa, Jaros is a recipient of the Wilson School’s R.W. van de Velde Award and two Shapiro Prizes for academic excellence from the University. Last spring, he co-organized a successful student-faculty colloquium on contemporary China titled “Keeping the Dragon Aloft.” He is a former vice president of the Princeton International Relations Council of the American Whig-Cliosophic Society and the current co-chair of the Princeton Institute for International and Regional Studies Undergraduate Fellows Program. He has been an intern in Princeton’s International Center since 2003. Jaros is a member of the non-staff editorial board of The Daily Princetonian, and has written a series of editorials and columns for the student newspaper. A backpacking trip leader for Outdoor Action (a University pre-orientation program), he also is a member of Topshelf, a student rock band that has performed in campus venues.